Over 150,000 Native Americans lived sustainably in California prior to the gold rush. They had existed for many centuries, supporting themselves mostly by hunting, gathering and fishing. This life changed drastically in 1848 when James Marshall discovered the yellow metal in the American River at Coloma, in Northern California. By 1870, there was an estimated native population of only 31,000 Californian Indians left. Over 60 percent of these indigenous people died from disease introduced by hundreds of thousands of so-called 49ers. However, local tribes were also systematically chased off their lands, marched to missions and reservations, enslaved and brutally massacred. In 1851, the California State government paid $1 million for scalping missions. You could still get $5 for a severed Indian head in Shasta in 1855, and twenty five cents for a scalp in Honey Lake in 1863. Over 4,000 Native American children were sold - prices ranged from $60 for a boy to $200 for a girl. The gold miners dug up 12 billion tons of earth - excavating river beds and blasting apart hillsides in their greed. In addition, they used mercury to extract gold from the ore, losing 7,600 tons of the toxic chemical into local rivers and lakes. The amount of mercury required to violate federal health standards today would be equivalent to one gram in a small lake. Although this gold rush ended in the late 19th century, a new gold rush began in the 1960s. In California, Nevada and around the globe, multinational companies have begun to use giant earth movers and new technology using deadly cyanide to extract gold from indigenous lands. About the artist: Denise Davis, whose family is from the Maidu tribe of the Sierra foothills, lives in Chico, California. 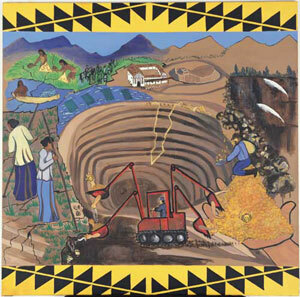 The design that frames this painting is a traditional Maidu basket pattern. It was Maidu land on which gold was originally discovered at the place we now know as Sutter's Mill.